It doesn't have a home button or a Bixby button. While we’re all waiting for the big unveiling of the Galaxy Note 9 next week, Samsung surprised us today with an update to its other productivity device, the Galaxy Tab S4. And this time around Samsung isn’t just taking aim at the iPad Pro, it’s also looking to challenge the Surface Laptop. Whether that strategy works remains to be seen, but Samsung is clearly switching gears with the Tab S4. Rather than promoting its “play” features, Samsung is calling its tablet a 2-in-1 device for its ability to switch between a traditional Android interface and Samsung’s PC-like DeX mode. Samsung debuted DeX with the Galaxy S9 last year, and it has since evolved from a dock to a mat and now to a single HDMI cable. You can also use the DeX interface on the tablet screen itself by attaching a compatible keyboard and mouse. Why this matters: Android tablets aren’t exactly the stuff of dreams, but Samsung is one of the few companies that make an Android tablet worth buying, so the Galaxy Tab S4 is an interesting pivot to productivity. It’s not that you couldn’t get serious work done on the Galaxy Tab S3, but Samsung is going all-in on DeX with the S4, positioning it as a true PC or Chromebook replacement. Apple and Microsoft probably don’t have too much to worry about, but anyone looking for a tablet for work definitely has a third option to consider. 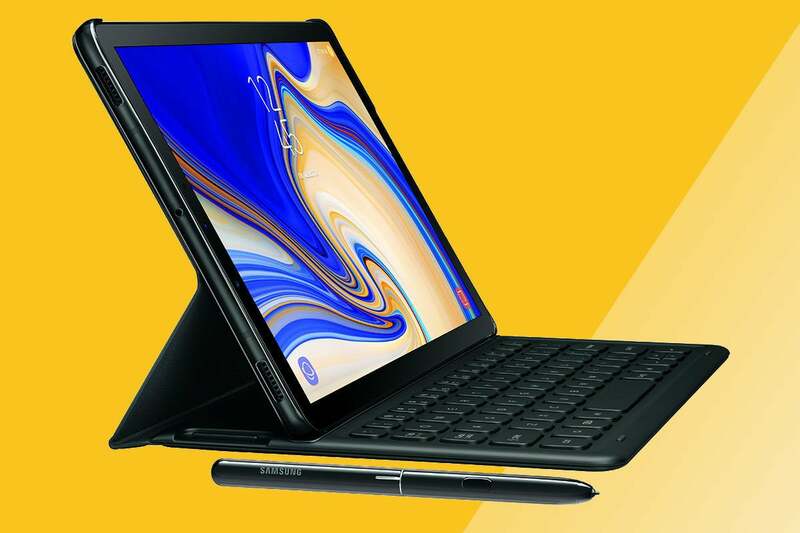 The Galaxy Tab S4 is an all-around upgrade over the S3, bringing a new design, better specs, and laser-sharp focus on productivity. It starts with the display. Where the Galaxy Tab S3 featured a 9.7-inch 2048 x 1536 HDR Super AMOLED display, the S4’s screen is nearly an inch bigger, at 10.5 inches and 2560 x 1600 resolution. That’s almost identical to the 10.5-inch iPad Pro’s 2224 x 1668 screen. Along with the new screen comes a new design the keeps the Galaxy Tab S4’s footprint manageable. Samsung has eliminated the home button and slimmed down the bezels to make them uniform all around the device. The result is an attractive yet unassuming tablet that looks natural at any angle (Samsung even eliminated its logo from the front.) The back of the S4 has the same all-glass aesthetic. The S3’s quad speaker system also makes a return, though this time around Samsung has added support for Dolby Atmos to accompany its HDR screen. It’s safe to say it’s the best movie-watching experience you’ll find on a tablet of this size. But one thing you won’t find on the Galaxy Tab S4 is a Bixby button. While Samsung has been relentless pushing its homegrown digital assistant with dedicated keys on its Galaxy phones, it stopped short of adding one here, though you can still access Bixby using voice. Samsung has also built in far-field microphones into the S4 so you can summon Bixby or Google Assistant from across the room. But while you can certainly have fun on Galaxy Tab S4, there’s no question that it’s designed for work. Once again, Samsung is selling a keyboard dock for $150 but on the S4 it doesn’t just let you type more comfortably—it also unlocks the unsung hero of Samsung’s productivity push, DeX. The Galaxy Tab S4 is an Android tablet that wants to be your work companion. While DeX may have started as a way to expand the Galaxy S8 and Note 8 to an external monitor, it makes a whole lot more sense on the tablet. For one, you can enter the PC-style DeX mode right on the Galaxy Tab S4’s screen, letting you resize windows and multitask just like you would on a Windows laptop. And you can also easily extend your S4’s screen using a single cable. Instead of a dock or a pad, you need only attach a USB-C-to-HDMI cable from the S4 to a monitor to enjoy the full-screen DeX experience. As always, Samsung is bundling an S-Pen in the box, but it still pales in comparison to Apple’s $99 Pencil. While there are strong rumors that Samsung will be shipping the Note 9 with an updated Bluetooth powered stylus, the Galaxy Tab S4 ships with the same dumb S-Pen. Samsung says it has been “refined,” but practically speaking, it has the same 4,096 pressure levels and 0.7mm tip. 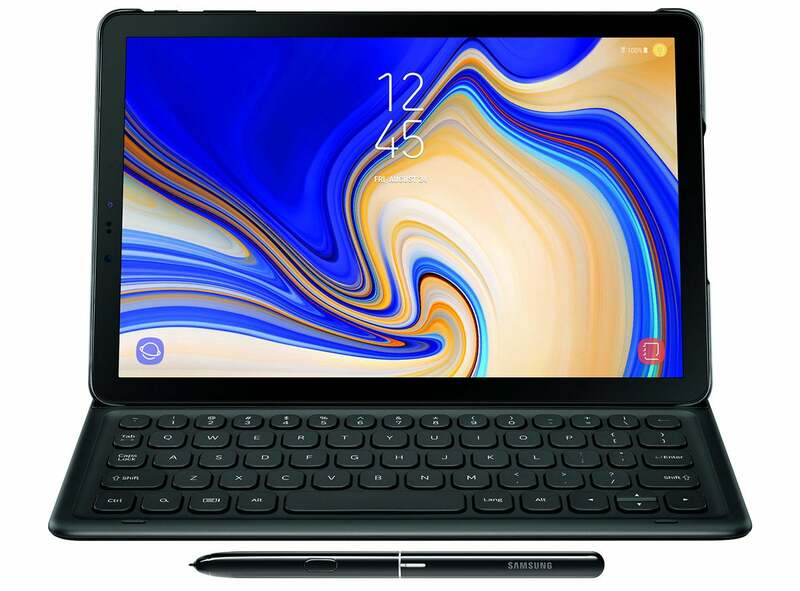 Available in black or gray, the Galaxy Tab S4 can be purchasedRemove non-product link beginning August 10 for $650 through Verizon, Best Buy, Amazon and Samsung.com. Anyone buying the tablet through Samsung.com through September 8 can receive 50 percent off on the $150 Book Cover Keyboard.